STATUE OF LIBERTY (USA) (Bay or Brown 2000-Stud 2004). 2 wins at 2, Royal Ascot Coventry S., Gr.3. Sire of 924 rnrs, 564 wnrs, 20 SW, inc. Hay List (MVRC Manikato S., Gr.1), Mic Mac, Star Exhibit, Active Minoru, Spirits Dance, Liberty's Gem, Miss Steele, Kikuno Storm, Dan Baroness, Golden Star, Black Mambazo, Dawn Approach, Miss Liberty, Lucky Liberty, Liberty Leader, Anadolu, Broadway Harmony, Kolokol, Elysees, Tempest Tost, etc. Indelo (g. by Niello). 3 wins from 1400m to 1600m to 2017-18 in Aust. Indiana Wolf (g. by Amadeus Wolf). 2 wins at 1200m, 1300m to 2018-19 in Aust. Indi. 2 wins. See above. Candoo Kid. Winner at 2 in Aust. SABATINI (Street Cry). 5 wins to 1400m, A$479,675, MRC Angus Armanasco S., Gr.2, Quezette S., Gr.3, Kevin Hayes S., Gr.3, Le Pine Funerals H., 2d VRC AV Kewney S., Gr.2, MRC Geoff Murphy H., 3d MRC Thousand Guineas, Gr.1, VRC Cap d'Antibes S., L.
VIVI VELOCE (More Than Ready). Winner at 2, A$120,120, SAJC National S., Gr.3, 2d VRC Ken Cox H., 3d SAJC Queen of the South S., Gr.2. Just Been Lucky (Encosta de Lago). 4 wins to 1200m, A$159,800, AJC Members' Terrace H., Rising Star NSW Apprentices H., BRC Madison Cleaning Services H., 2d GCTC Silk Stocking H., L, STC Theraces.com.au H., 3d BRC Bright Shadow H., L, Qld Tatt's RC Southbank Insurance Brokers H., BRC Normanby Hotel H., Subiaco Hair P.
Bronc (Distorted Humor). 5 wins to 1200m, 3d VRC Rory's Jester P., Gr.3, MRC Club 2YO P., MVRC Garfunkle H.
TOLUKA - POWER OF KHAN (Mal.) (General Nediym). 5 wins-1 at 2-from 1100m to 1600m, A$15,120, 327,264Rgt. in Aust. and Malaysia, Selangor Gold Cup, L.
Workman. 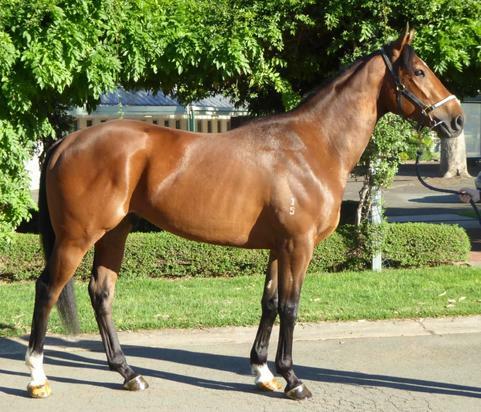 5 wins from 1300m to 2400m, WATC Fair's Print H., 2d WATC Chambers Investments H.
Shadrach (Lonhro). 3 wins at 1400m, 1550m, A$127,630, SAJC Adelaide Casino H., Schweppes P., 2d SAJC Allan Scott Park Chairmans H., CBUS Building Super P., 3d SAJC Breeders' S., Gr.3, Queen Adelaide S., L, Magic Millions 2YO Classic, Sam Newman H., SA Thoroughbred Breeders H., Boag's Draught H., Paul Snigg H., Scott Group of Companies P., 4th SAJC Sires' Produce S., Gr.3. Goldbya (Dylan Thomas). 5 wins from 1200m to 1600m, A$193,690, SAJC Kytons Bakery H., David Loy H., Hindmarsh Plumbing H., 2d SAJC Adelaide Guineas, L, Desiree Gill Memorial H., Melbourne Cup Live at Morphettville H., MAC Just Over? Don't Drive H., 3d SAJC Pure Envy H.
Superior Warrior. Winner at 1200m, HKJC Wan Tsui H., 2d HKJC Topaz P., Tai Mong Tsai H., 3d HKJC Heung Yip H., Irving H., Grayburn H., Lok Wah H., Percival H.